Large open plan floorplates and a sloping terraced façade are two elements adorning this City of London Grade A office development. 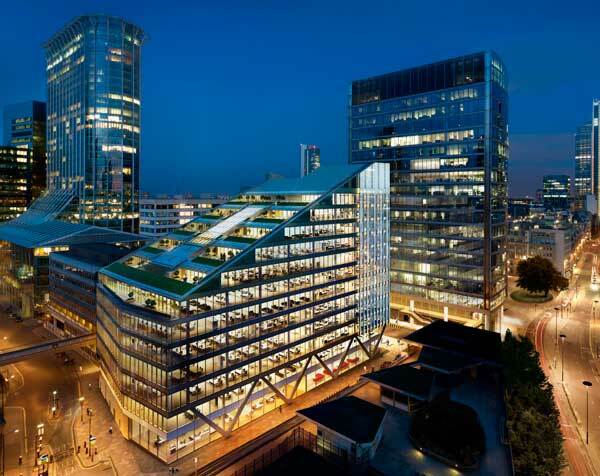 Client: Blackrock Designed as a large rectangular block which stands out from its more sober looking neighbours, Moorgate Exchange is dominated by an eye-catching angled façade containing stepped gardens on its six upper levels. With a BREEAM “Excellent” rating, the 18,500m² steel-framed building has uniform, square open plan floorplates arranged around a central atrium and two main cores. The design ensures flexibility, as all of the floors can be subdivided if necessary. The building’s structural floor zone was designed to be the minimum depth possible in order to accommodate the required services openings, which allowed an additional floor to be introduced at the top of the building. In order to negate any vibration issues associated with the structure’s long 15.5m spans, Ramboll decided to use intermediate stiffener beams to achieve the required floor response. “By inserting intermediate beams at midspan between the main beams, we stiffened the floor successfully, reduced the response factor and we were able to use shallower sections which helped us gain the extra floor,” says Ramboll Project Director Alex Baalham. Stiffener beams and the large open grid pattern remains the same all the way up to the top office level. 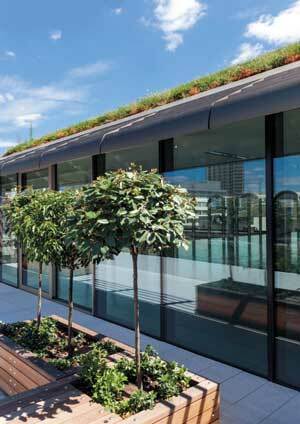 However, the outdoor terraces required a deeper floor zone, due to waterproofing and drainage. To keep the same floor-to-ceiling heights on all floors, the Fabsec floor beams used for the terrace areas were reduced in depth, with a shallower but heavier section being used. By utilising steel rather than concrete, the building was able to achieve long column-free spans as well as reducing the overall floor zone, increasing the maximum number of storeys, and increasing the net lettable space for the client due to fewer and smaller columns. The complex terrace transfer system also would not have been as efficient without the use of steel, while the structure is also far more adaptable to future tenant changes than a concrete equivalent would be. The steel frame was designed and rationalised to allow easier fabrication of the elements. This included using standard plate thicknesses that could be used to fabricate a number of different beams. At ground level, the most striking visual elements of the building are two rows of concrete encased V-shaped columns, positioned along the two longest elevations. The two-storey high raking columns were fabricated from square hollow sections which were encased in concrete, producing a member that tapers from 900mm to 600mm. These columns were initially designed into the scheme as a way of avoiding an old subterranean telecommunications chamber that intrudes into the southwest corner of the project’s footprint. “We suggested raking columns for this one area of the building as an engineering solution, which was then incorporated as a striking architectural feature and developed into the two colonnades of V-columns running the full length of the north and south elevations” explains Mr Baalham. 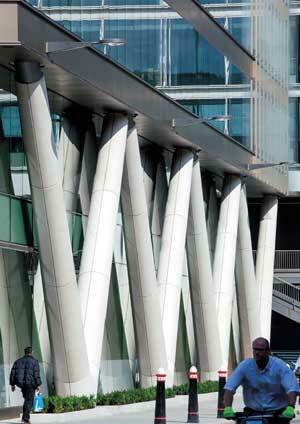 In total there are four pairs of V-shaped columns on each side of the building. Weighing 11t each, the columns were erected individually and are bolted to a ground level two-way node that helps form the desired V formation. The nodes weigh 3t each and are encased within a concrete base. At the top, each raking column is connected to the underside of the second storey beam by a bolted connection. Within the structure, long span open column-free areas dominate the design. The client wanted to maximise the floorspace and consequently typical spans in the building are 15.5m long. 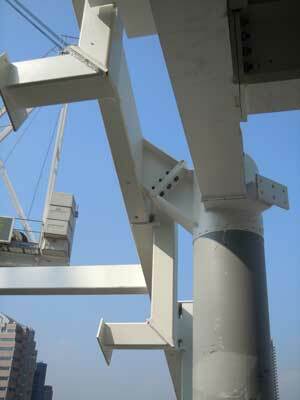 The majority of the columns are 457mm diameter CHS members to maximise the available floor space. They have been infilled with concrete to achieve the required fire rating and left exposed by the architect as part of the design. “The relationship between Skanska and Severfield has developed and strengthened over the years because employees from both companies have worked together on previous projects. In summary the Judges say, the team maximised the net lettable space by exploiting the great benefits of a steel frame – long clear spans with minimal fire-engineered columns, and with a reduced overall floor depth that enabled the incorporation of an additional storey.